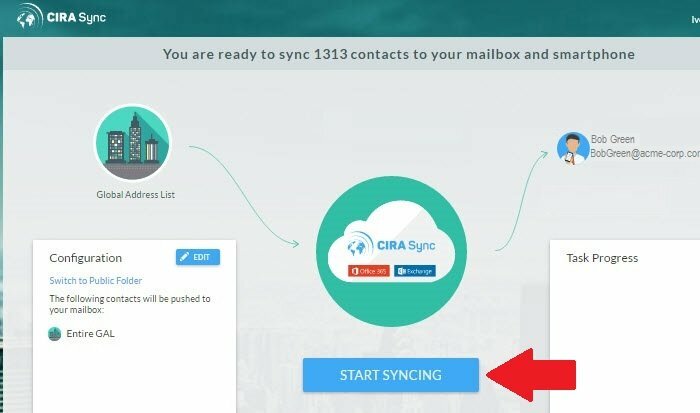 If your company email is on Office 365 and you need to sync public folder contacts, that’s easily accomplished with CiraSync. You can try this out with the Personal Edition of CiraSync, which is free. It updates any number of contacts from the GAL or public folders to a single mobile user. The Personal Edition is a gateway to the CiraSync Enterprise Edition, which allows Global Admins to manage contact and calendar sync for any of the office 365 users in their tenant. When you are ready to try CiraSync , log in using your Office 365 credentials. Start with the Personal Edition of CiraSync by logging into Office 365. Fill in your Office 365 email address, and click on Proceed. That will take you to the Microsoft online login page where you will validate the credentials for your mailbox. Cirasync uses the Azure consent model. The first time you sign into CiraSync, you will need to grant consent for the application to read and write to your contacts. On the screen below, the CiraSync contact manager is requesting permission to read your contacts, access your mailboxes, and read contacts in your Public Folders. Giving Cirasync permission to sync your contacts does not put your passwords at risk. When you click Accept, you are immediately taken to the CiraSync setup wizard, where you can sync the GAL with a single click. The default is to sync the GAL, since that is the most common operation. Switch from the GAL to Public Folder sync. Switch to Public Folder . Expand the folder hierarchy and navigate to the contact folder you wish to sync. Note: the solo, Personal Edition of CiraSync does not sync calendars. If you are looking for calendar sync, you can switch to a trial of CiraSync Enterprise Edition. Navigate in the folder hierarchy to select a specific folder as your sync source. Choose the source folder from which you will sync contacts. We’ll pick one called Industry_contacts. Your screens will display your folders and contacts, of course, so you will choose from what you see in your hierarchy. In this, the Personal Edition, you can draw from a single public folder. The Enterprise Edition can sync multiple folders to specific sets of mobile users; for example, vendor contacts might be synced to one set of employees while customers are synced to another department. Now you should see this screen, showing the Public Folder you selected on the left. Note: Not all Android phones support sub-folder sync. Step 5. Pull the Trigger → Sync! Next, navigate to the Sync Now button and click it. The Public Folder called industry_contacts has been selected for syncing. The sync to your Outlook folder is fast. 100 contacts should take a minute or two, while 10,000 contacts might take 30 minutes. Subsequent syncs will be tend to be quicker, since they only update the particular fields that have changed. In other words, CiraSync updates incrementally. At this point you are ready to sync the folder you selected, but first launch Outlook so you will be able to check that your Outlook folders get updated. If you use Outlook Web Access, it can be a bit tricky to verify the exact results. We do recommend the desktop version of Outlook for this initial verification. Take a peek at your Outlook, and you will see that the newly added contacts are now in the new folder entitled CiraSync – a name that should never collide with any existing folder name you have. The Personal Edition always writes updates to a folder named CiraSync, but if you graduate to the free trial of Enterprise Edition, you will be able to choose any subfolder name as the destination for updates. Click on SCHEDULE, which takes you to the CiraSync Dashboard screen. You can see the Schedule control panel on the lower right. Scheduling should appear as Enabled. .
Click EDIT and choose a daily time for subsequent automatic updates. Step 8. Admire your work. Now that you’ve mastered the process, let’s quickly summarize what just happened. You logged into the CiraSync dashboard, which made a call to Office 365. Microsoft then asked you to authenticate your username and password. For security, no password was revealed to CiraSync in this process. Next, you used the Setup Wizard to configure the dashboard to sync from a Public Folder. You triggered the initial sync, verified its success by looking in your Outlook, and then you set a schedule for ongoing daily updates. There was nothing to install on a server, desktop, or end-user device. In other words, there was no configuration needed. Step 9. Relax. It’s handled. When you’re ready, go Enterprise. From here on, CiraSync will update your smartphone (and Outlook) on schedule. Once you have seen it work for a few days, you can take the step of testing a pilot group of smartphone users on a zero-cost trial of Enterprise Edition. Your colleagues will thank you when you do, and it’s nearly as simple and fast as setting up the Personal Edition, but Enterprise Edition has much more extensive functionality. The Enterprise Edition is a centrally managed solution that syncs multiple contact lists for your entire tenant. The Enterprise Edition trial is usually for up to 100 users. To graduate to the Enterprise Edition trial, scroll down on the CiraSync Dashboard, and click Upgrade to Enterprise Edition. You will be asked to grant additional consent to CiraSync, and we will automatically authorize your free trial for 30 days and up to 100 users. You can also request a sales quote.